The present work rests and elaborates on the assumption that social technologies are increasingly turned into computer-mediated virtual settlements, thereby allowing the excavation of a variety of enacted cyber-phenomena such as ad hoc online ensembles, informal social networks and virtual communities, on the grounds of “digital” traces or remains. In this vein, the authors motivate and present a method for virtual excavations that is tightly coupled to a transformational technology such as knowledge visualization. 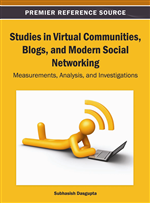 The analytical and explanatory value of the method is assessed using two case studies addressing representative genres of social technologies, namely web sites augmented with social plug-ins and social networking services. Analysis reveals intrinsic aspects of “digital” traces and remains, the form they take in today’s social web and the means through which they can be excavated and transformed to useful information. It turns out that such virtual excavations, when organized and conducted carefully, can be of benefit to enterprises, service organizations and public sector institutions. In addition, their tight coupling with knowledge visualization eliminates extensive data analysis as much of this work can be done using the visualization. On the other hand, and depending on the size of digital trace data, the choice of visualizations and the underlying toolkit are of paramount importance. The emergence of Web 2.0, the rapid adoption of social computing and the supporting technologies such as blogging and micro-blogging platforms, social commenting plug-ins, etc., turn users from passive information consumers into active content producers. This is mainly achieved through a variety of opportunities for sharing users’ own content, commenting on articles submitted by others or responding to peers’ contributions (Kim, Jeong, & Lee, 2010). In many cases, users may not have pre-existent relationships, may not know each other and may never interact again (Gochenour, 2006). Yet, such recurrent co-engagements amongst ambient affiliates frequently materialize into social bonds and a kind of “knowing” through co-practicing. Recent scholarship, although acknowledging the possibilities offered by social technologies and platforms to facilitate a variety of cyber-formations (Blanchard & Markus, 2004; Jacovi et al., 2011; Kim et al., 2010; Zhao, Grasmuck, & Martin, 2008), does not provide sufficient details on core features embedded in technologies and driving their distributed (re-) organizing capacity. As a result, it is not clear how new capabilities such as increased information and social connectivity amongst users, are implicated by technology-inscribed affordances such as user profiling mechanisms, moderating functions or simulations. At the same time, it becomes increasingly evident that intrinsic aspects of profile management and moderation, not only implicate new patterns of use (for instance multiple identity management across virtual settings), but also manifest a wealth of cultural knowledge about users. Consequently, there is a need to study systematically what it is that enables or constrains configurations of people, artifacts and social relations under different regimes of sharing and what technology features form pre-requisites for an improved understanding of enacted social formations and their practices in virtual settings. The definition rests on the assumption that certain (if not all) activities in virtual settings create electronic traces. Then, by working with these traces researchers could re-construct or gain insights into an online setting and the context within which such activities are conducted (Akoumianakis, 2010), just as archaeologists reconstruct and/or gain insights into a past culture by retrieving, working with, indexing and interpreting remains in conventional archaeological settlements (Fahlander & Oestigaard, 2004). The value of such “virtual” excavation is that it creates a “gold mine” of social data, reflecting deeper insights into online discourse, trends in user communities (i.e., opinions, interests and beliefs), prevalent online behaviors, “hidden” knowledge as well as how these are socially constituted and emerging through time. A pre-requisite however is the technology’s-embedded capability to extract, analyze and ascribe meaning to such data which otherwise remain bytes of code. For this purpose, recent work exploits a variety of methods including graph-based techniques and algorithms (Lin, Sundaram, Chi, Tatemura, & Tseng, 2006; Zhou & Davis, 2007), social network analysis (Daniel & Schwier, 2010) and advanced knowledge visualization (Akoumianakis, 2011) to account for digital traces and remains. Using this lens and concrete case studies that reveal not only commonalities across regimes of sharing user-generated content, but also key differences, we attempt to qualify virtual excavations in an effort to gain insight into cyber-formations enacted online and the features that distinguish their genre.